It's time to honor the central person whose vision launched a Sorority for African-American women with the purpose of service to mankind. In 1908, because of the leadership, determination, savvy, political and intellectual skill of Ethel Hedgeman Lyle, Alpha Kappa Alpha Sorority, Incorporated® was founded. She identified and recruited talented young ladies who worked with her to get the job done. Her legacy has been far reaching. She was an outstanding educator and civic leader. Ethel Hedgeman Lyle was the first college-trained African American teacher in Oklahoma and was exemplary in her methods and service. In 2015, in recognition of her extraordinary achievements, a state highway was dedicated in her honor in Eufaula, Oklahoma. Today, with over 290,000 members, this 109-year-old Sisterhood has touched every corner of the United States and nearly every continent in the world, conducting service projects that have impacted generations of people. 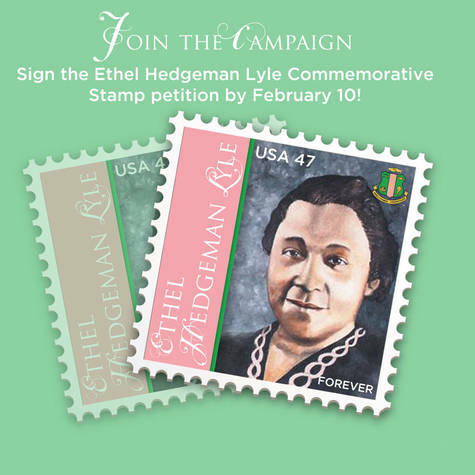 Ethel Hedgeman Lyle has made significant impact on the American culture through her noteworthy and enduring contributions to our society and history. It is time to honor this civic visionary, and have her join the ranks of other remarkable and historic figures of America and the world, by having her image appear on a U.S. postal stamp. We need your help to make it happen. HOW? By engaging the global community and your centers of influence, including elected officials, White House contacts, entertainers and our networks to assist us in this petition drive. We want there to be no doubt as we make this illustrious woman’s achievements known, as we make our application to the United States Postal Service Stamp Selection Committee. We are compiling her bio and the impact of her vision and good works on the world and will include compelling information to assist in promoting this effort. This e-petition will be used as part of our application for the stamp. Everyone is encouraged to sign the petition, and get family members and friends to go online and join us in this effort by also signing the e-petition. We need over 110,000 signatures to be considered. Advanced earlier under the leadership of International Presidents Dr. Mary Shy Scott and Dr. Eva L. Evans, International President Dorothy Buckhanan Wilson has determined its time to Launch New Dimensions of Service by having hard copy mail delivered all over this world, stamped with the image of the premier Founder of Alpha Kappa Alpha Sorority, Incorporated®, Ethel Hedgeman Lyle. Let’s do it! It's time!